When Joseph Kidd and Ann Poole left North Wexford for Ontario, Canada, in 1824 with their children, they cannot have foreseen that, in 2017, four descendants would arrive back in Gorey seeking to walk in their footsteps. And, yet, in June, Corinne Simser-Wagg (Goderich, Ontario), Nancy Robinson (Montreal), and Jane Thompson (Toronto) were joined by Californian Heidi Cavagnolo (Los Gatos, south of San Francisco) as they looked across landscapes familiar to their extended family almost 200 years ago. 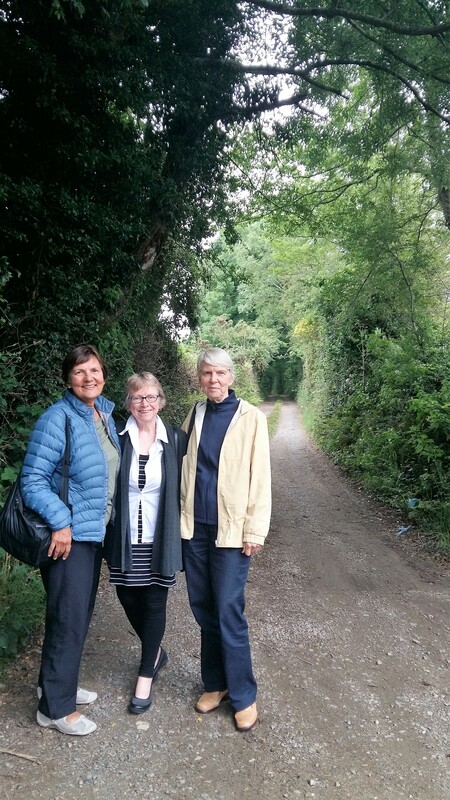 Heidi Cavagnolo, Corinne Simser-Wagg, and Nancy Robinson who came to North Wexford to trace family roots going back almost 200 years. Joseph and Ann’s daughter, Elizabeth, went on to marry Henry Morris (another Irish immigrant) in Ontario. Three of the women – Nancy, Corinne, and Heidi descend from Elizabeth and Henry Morris and Jane from Elizabeth’s sister, Ann Kidd. The foursome, who found each other over 15 years ago whilst researching their family trees, have their Irish roots firmly located in North Wexford, with Askamore, Donishal, Monamolin, Ardamine, and Ballycanew all popping up. Before their research the women never had a strong sense of their Irish heritage. “I found out about my Irish connection through researching Ann Morris (whom we are pretty sure was Ann Tyndall before marrying),” says Nancy. Heidi had heard about a Scots-Irish connection from a grandmother – “the first time I was in Ireland, I was looking for my ancestors in Enniskillen”, she laughs. And, now that they have visited North Wexford, does the sense of Irishness mean something to them. “For me, it’s knowing where I came from, I was interested in knowing what our ancestors had perhaps experienced with the various conflicts and especially the 1798 Uprising,” said Nancy. For Corinne, “family is at the centre of everything, and digging deeper makes the family tree stronger – and our research will be there for our kids”. For Heidi, it helped to “put a face on the original places where they lived”. The Irish connection has also made firm friends of the four women – whilst Nancy and Corinne have known each other since they were aged four, Corinne and Heidi connected online while researching the Irish angle and Jane and Corinne also met through their research in the last 15 years. This friendship has seen them bring Heidi north from sunny California to visit Leeds County, along the St Lawrence River, in Ontario where the Kidds originally settled along with many other Wexford emigrants. Joseph Kidd made beaver hats in Gorey and though he petitioned but died before receiving land from the Crown in Simcoe County (north west of Toronto), his family subsequently secured 1000 acres and went on to trade both as farmers, shopkeepers, hoteliers and more in their new home. A highlight of the trip home was finding the grave and headstone of their oldest common ancestor, Ann Elizabeth Buckinger, in the Gorey Market Square cemetery. Ann, who died in 1777, aged 77, was a Theis of Gorey, and fourth wife of Matthew Buckinger, a famous magician. Ann’s daughter subsequently married a Poole (both Palatine families who settled on the Ram estate in 1710). Other highlights included, for Jane, seeing the settings from which her ancestors originated. For Heidi, it was the Byrne Perry Heritage Festival walk through the area walked by her ancestors. Nancy also found the Byrne Perry walk extremely interesting – “seeing the landscape brought it closer to home and more real”. The foursome also enjoyed the local food, especially Wexford’s renowned strawberries and cheese and appreciate the help of genealogists Bernie Walsh and John Nangle who drove them to cemeteries, churches, archives and libraries and offered many good suggestions. Unfortunately, they were not successful, nor were they successful in finding any Tyndalls to confirm a direct relationship with their Ann Tyndall Morris. Next up, Jane and Heidi will explore the data and suggestions they picked up on their trip to see which avenue to explore next. Will they come back? Probably …!